Around the nation, innovative models are bringing fresh food to more people who lack access to it. Inside the BP gas station at 4501 Cleveland Avenue on the east side of Kansas City, Missouri, customers can purchase 10-cent tomatoes, 25-cent lemons, and 50-cent asparagus bunches. A gas station might seem like an unusual place to buy groceries, but gas stations are everywhere, and access to fresh food is a big problem for many U.S. communities. Approximately 2.2 percent of all U.S. households lack a car and lie more than a mile from a supermarket, according to a report from the Economic Research Service of the U.S. Department of Agriculture (USDA). And studies have noted direct correlations between cardiac health, or stroke and cancer incidence, versus levels of fruit and vegetable consumption. He began by delivering fresh produce to the predominantly low-income African American neighborhood of Ivanhoe, providing thousands of pounds of fruits and vegetables over several months to The Cakery Bread and Bakery Outlet, a store selling discounted bread and bakery snacks. “People flock [here] when they see his truck,” says The Cakery owner D’Vonta Richard. Kanbe’s Markets currently serves six Kansas City sites—gas stations, retailers, like The Cakery and others—and has more than a dozen more on his waiting list. He hopes to start serving them, too, as soon as he raises enough money to hire some support. Those waiting are retailers with community ties located in lower-income neighborhoods, and Kaniger says he will expand into locations in areas classified by the USDA as food deserts. 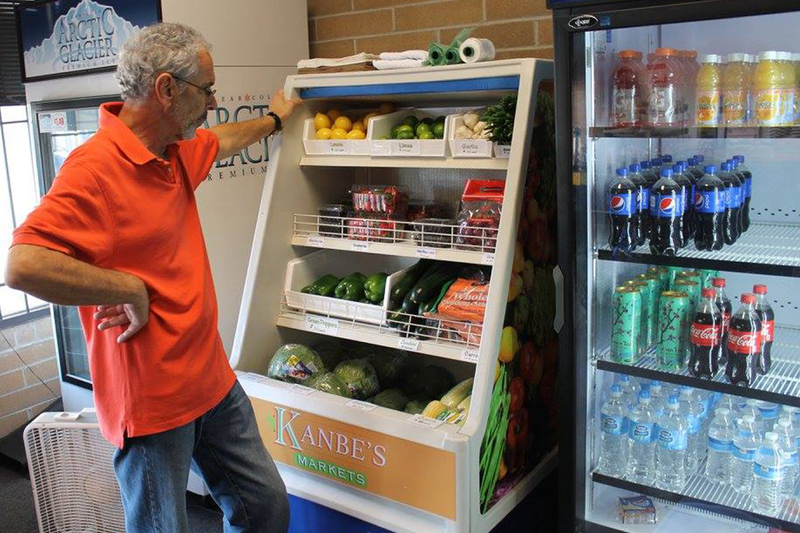 At each location he serves, Kaniger places refrigerated kiosks and produce baskets in each store, at no cost to the owners, filling them with around 25 different items, all offered to the retailer on consignment. “I like to have our food as close to the front as possible but that comes down to what the store owner wants,” Kaniger says. Kaniger procures food from a variety of sources. Local wholesaler C&C Produce donates many items, and he purchases others from them. “Our purchases vary every week, but right now our biggest purchase each week would be grapes and strawberries; we buy about 25 cases of each every week,” Kaniger says, adding that broccoli, cabbage, carrots, and oranges are also among their most in-demand foods. In his work with Kanbe’s, Kaniger has also collaborated with Stock Healthy, Shop Healthy, a program from the University of Missouri Extension that facilitates community access to healthy affordable foods by working with small food retailers. Kaniger says the program has already helped Kanbe’s by supplying educational materials, and as he expands he intends to work with them to identify even more locations to add. Right now, Kaniger lives off of his savings plus occasional restaurant shifts at Harry’s Country Club and relies on frequent “friend-raisers,” grant money, and generous individual donations help to defray the costs of running the nonprofit. 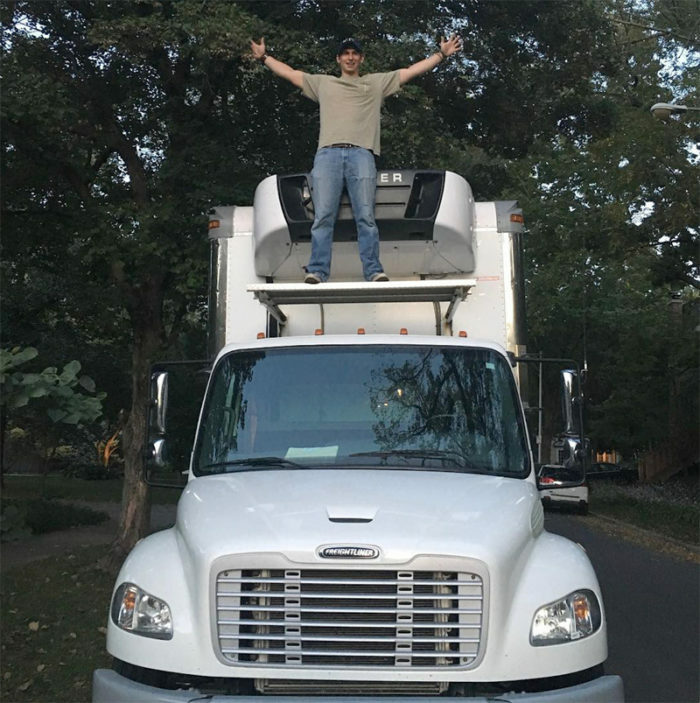 While working toward providing himself with a salary, Kaniger recently hired a high school student as summer intern through Hire KC Youth, who helps him with deliveries. 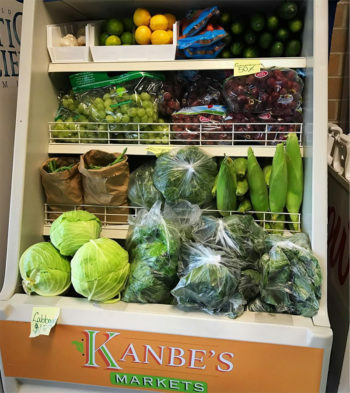 From Philadelphia to Detroit to San Francisco, Kanbe’s is just one of many efforts across the U.S. working to increase urban residents’ access to fresh food, providing fresh produce and nutrition education to people who otherwise lack access. Some successful efforts include, Philadelphia’s Healthy Corner Store Initiative, Indianapolis’s Garden on the Go, Detroit’s Fresh Corner Café, San Francisco’s Tenderloin Healthy Corner Store Coalition, and Oakland’s People’s Community Market. When Peaches & Greens Produce Market launched in Detroit’s Central Woodward area in 2008, more than half a million residents could more easily access fast food than a full-service grocery store. Today it sells produce and healthy snacks and beverages—including water. There are no fried items, items where sugar is one of the first several ingredients, or donuts. What makes the store distinctive is its location in the middle of a low-income community. Now, in addition to its brick-and-mortar store, Peaches & Greens staffs eight farm stands that sell produce from growers throughout the state. Three operate in cooperation with existing farmers’ markets and five are solo; the stands accept SNAP, cash, and credit. There are also deliveries to some individuals who can’t get out easily on their own. “The overall mission [of Peaches & Greens] is to provide access to healthy affordable fresh produce, to educate our community about healthy eating and cooking, and to advocate for health-related issues,” says Lisa Johanon, executive director of the Central Detroit Christian Community Development Corporation, of which Peaches & Greens is a wholly owned subsidiary. Before neighborhood resident Uclesha Ray started managing the farm stands this spring, she didn’t know much about Peaches & Greens. But since working the stands, she has noticed the attitudes among her farm stand customers have begun to change. “People of all ages are becoming more aware of the produce, and I’m seeing repeat customers too,” she says. “We have better quality and prices than a big box store does.” Ray says. “I think what’s unique about the market is the steady increase in people signing up for our customer loyalty program for SNAP and WIC recipients,” says Kris Soebroto, program director at Village Gardens. “More and more people are redeeming their points when their benefit [dollars] are low. 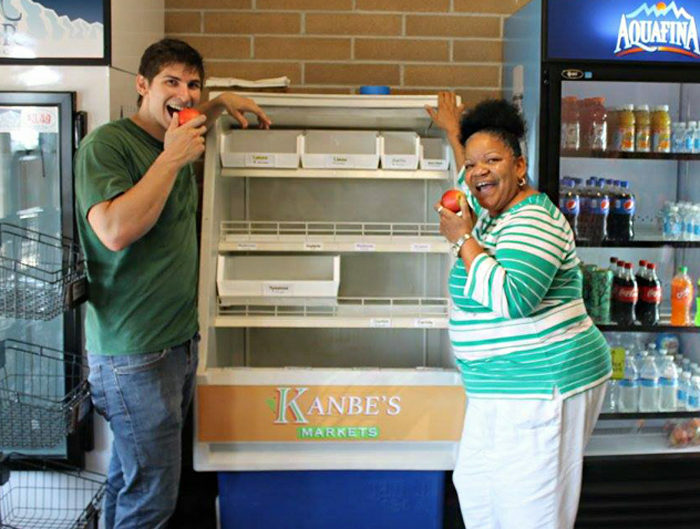 Sometimes, fresh-produce programs like Kanbe’s and others are not enough on their own. Take the Minneapolis Health Department’s Minneapolis Healthy Corner Stores, as an example. The program which ran from 2010-2015, was intended “to help corner stores learn to successfully sell fruit and vegetables,” says Kristen Klingler, an assistant manager at the health department’s Healthy Living Initiative. Even as the Healthy Corner Stores program was winding down in 2015, the city stepped up its Staple Foods Ordinance, which requires stores licensed to sell food items—including corner stores and gas stations as well as traditional grocery stores—to stock healthy items from 10 categories including fruits and vegetables, whole grains, and dairy. As part of this approach, Klingler says the city has begun training health inspectors to go out and monitor stores’ compliance with the ordinance. Kaniger, who is still charting his course to expanding Kanbe’s Markets’ reach and impact, is optimistic about the power of community involvement as key to the future. “When we all work together, we can make real change,” he says. The local food movement is fueled by champions with a cause, and Max Kaniger is a Kan-do guy who proves that! Bravo!